Super Tarpaulin 220gsm - The Ultimate in Woven Tarpaulin. Scaffold Cladding - Debris Netting etc. Cricket Accessories - Covers - Netting etc. 45mm x 5mm Knotless Netting. 45mm x 3mm Knotless Netting. Extra Heavy Duty Polythene Sheeting (1000gauge). 66mtr x 50mm Printed Fragile Tape. 33mtr x 50mm Hazard Warning Tape. Need help with placing an order? Red Reinforced Tarpaulin 4m x 4m Ideal for many applications. 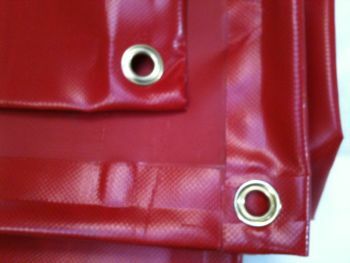 Red Reinforced Tarpaulin has a wide range of tarpaulin for many applications. All made from our top quality reinforced pvc material. The covers are made from a 610gsm material which really is the ultimate in protection and durability. 100% waterproof and UV resistant make them the perfect choice. If you are unsure or you would like something bespoke, please ask for samples or send us an email with your drawings/requirements. With the exception of Netting and Bulky Items, all our products are shipped on a 2-3 days service. Next day and Next day AM options are also available, For full details click on delivery information.